Discussions on India’s judiciary will always mention pendency of cases and shortage of judges—it is claimed the former is a consequence of the latter and of how time is managed. 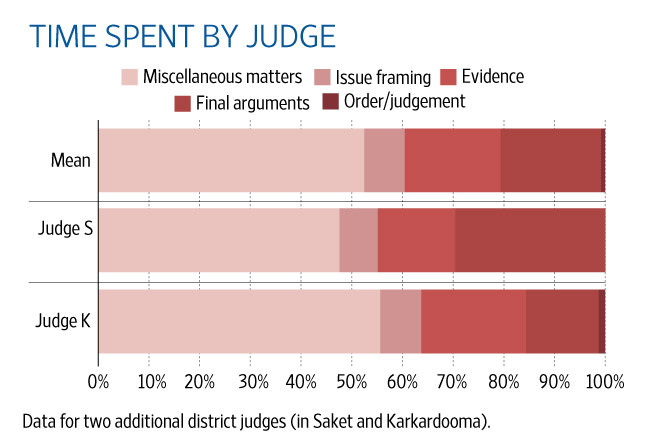 Subordinate courts in Bengaluru and Delhi, for example, spent about 44% and 52% of their time, respectively, on adjournments, summons and “miscellaneous” matters—these being purely procedural and administrative in nature, not really requiring the expertise and depth of judges—and none of that time leading to resolution of cases. This means that Karnataka spends about Rs80-150 crore on adjournments, which is a substantial 12-22% of the annual expenditure by the state on the judiciary. This is only the direct cost incurred by the state and does not consider indirect charges such as cost of litigation to the parties and opportunity costs. The time taken in rendering justice can be measured in many ways. How long does it take for a case to be disposed of by a court? How long it takes for a matter to be resolved by all the courts/forums in the judicial delivery system? How does the time taken vary between courts and types of cases? How does the court manage its time on a day-to-day basis? And so on. While an answer to each question is important, the last one about day-to-day time management forms the basic building block for all other analysis. There have been many studies internationally to assess the performance of judges in a single day in the courtroom. In the US, studies have been conducted to see how much time judicial officers spend on activities throughout the day. Such data helps with a comparable measure of the amount of time and number of judicial officers necessary for effective resolution. No such study has been carried out in the Indian context. The Centre for Civil Society (CCS) and DAKSH, an organization that is working on mapping administration of justice using empirical and quantitative methods, independently observed some subordinate courts, selected randomly, in Delhi and Bengaluru. These studies are not intended to form any value judgement on judicial efficiency or the performance of judges. A judge spends her day not only hearing cases, but also in administrative issues outside the courtroom. These studies were focused only on the time spent by the judge in the court. 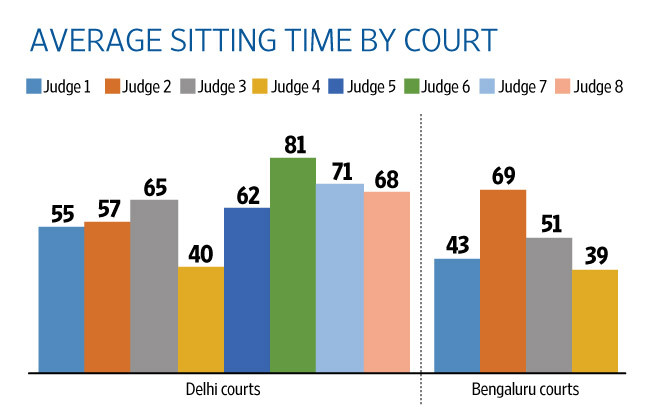 In certain subordinate courts in Bengaluru (two civil and two criminal), judges sat for about half of the 390 minutes available daily; in Delhi (eight additional district judges), they sat for 62% of the 330 available minutes. 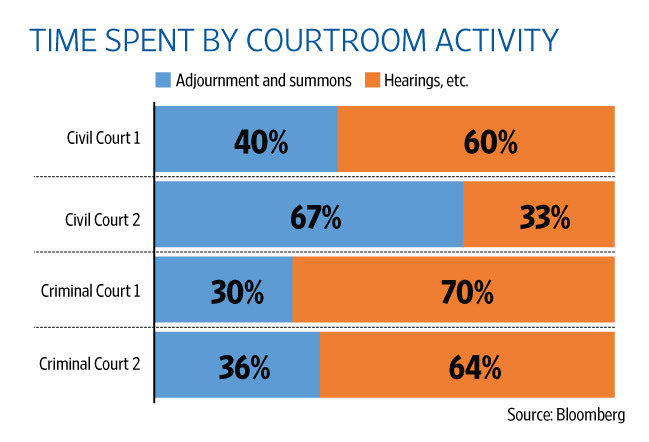 This provides us a picture of how judicial time is allocated between its various activities. In Bengaluru, DAKSH observed proceedings over five days. Only about 56% of daily sitting time was spent on hearings and other proceedings. On average, about 1.5 minutes were spent per adjournment matter and 12 minutes per hearing matter. On an average, 50 matters were listed and six were heard daily. The number of matters listed for a day was as high as 150 in one court on one of the days. In Karnataka, two types of cause-lists (schedules of cases to be heard the next day)—one for administrative, clerical aspects and another for hearing substantive aspects—required as per Karnataka Case Flow Management Rules were not being prepared. They do not adhere to the ceiling on the number of items listed for substantive matters. Cause-lists are sometimes not uploaded to court websites. Court clerks attributed this to lack of personnel. In Delhi, CCS observed proceedings before two additional district judges courts over three days—the data is an average of each judge’s proceedings. This study records their time allocation on each category of listed cases—“miscellaneous” includes fresh matters and completion of pleadings and arguments on applications. In court cause-lists, miscellaneous matters include clerical and some non-clerical tasks. Evidence includes the plaintiff’s as well as the defendant’s. An average of 19% of time was spent considering evidence. The completion of pleadings and evidence for fresh suits are dealt by the registrar’s court in the Delhi high court, but in the lower courts, a judge is burdened with all kinds of tasks including clerical ones. There are possible solutions to these problems. For example, adjournment and miscellaneous matters could be handled by non-judicial staff. Administrative and clerical activity could be completed prior to the listing of matters. Even by most conservative estimates, lower courts could double their cost-efficiency ratio if clerical functions are delegated to administrative or court staff. Certain judicial tasks such as evidence or cross-examination also could be delegated to the local commissioner or lawyer to supervise and record the evidence if both parties agree to such an arrangement. By assigning other officials, courts could maximize the usage of time to hear substantive arguments in matters and help curb the culture of adjournments. A few judges have already adopted this procedure and the high courts have also approved this practice. For other judicial tasks, law clerks could be appointed to assist lower court judges. Most high court and Supreme Court judges have law clerks to assist them. This study was restricted to observing time spent in court and not meant to indicate the efficiency of judges. They may finish matters earlier than the close of working hours or engage in other work such as research and the writing of judgments. An empirical understanding of how courts spend time on judicial, administrative and clerical activities would help in proposing solutions that would maximize judicial time and reduce the pressure on judges. Such studies can also help in estimating the exact number of judges required; on a larger scale, they could help gain a deeper understanding about the functioning of courts so necessary to begin solving the problem of pendency. Prashant Narang is an advocate leading iJustice, a public interest law initiative of Centre for Civil Society, New Delhi. Surya Prakash B.S., a chartered accountant and lawyer, is programme director at DAKSH, Bengaluru. Read the story on Live Mint website.